In the last year, I’ve been on over 100 flights. This isn’t impressive, so much as it’s ridiculous. Even more ridiculous is my fear of flying that only gets worse with age (and I’m not even that old, so who knows how bad it’ll get). It was never really that bad until I was on a Swiss Air flight from Los Angeles to Zurich and there was non-stop turbulence the entire time (for not good reasons that I could see. How can half the planet cause turbulence!?). In addition to the pilots never communicating to passengers, it was a harrowing experience. Another offered me some herbal relaxants (who knew they carried these on planes for scared passengers! ), but I declined and tried to curl up in a ball and sleep. Another flight attendant showed me some breathing techniques to help with hyperventilation and to calm the nerves, since I declined a gin and tonic. Since most of the fear associated with flying is all in the head, I asked the flight attendants why THEY weren’t afraid, to see if my brain could process this and make some sense out of it. They simply said that 1) they’ve felt much worse 2) turbulence doesn’t really mean anything but bumps in the clouds, much like driving over a bumpy road. I’d like to say that information helped, but only slightly. What did/does help, was distracting my brain enough so it couldn’t be afraid. Elevated states of fear for extended periods of time could likely do some damage (racing heart for 8 hours? Probably not good for anyone). The following is a short list of techniques that I’ve used for coping with a case of the flight fears. 1) Breathing properly (without over indulging on that sweet airplane air). Actually, remembering to breathe in general is pretty key to coping with fears. This one amazing flight attendant sat down with me and showed me the alternate nostril breathing technique for anxiety. It’s similar to what yoga teaches for balancing chakras. In essence, holding one nostril closed and breathing in for 6 seconds, and then breathing out the other nostril for 6 seconds. Repeat. The increase in oxygen will also make you think better and hopefully better rationalize. I don’t mean just watching a movie or reading a book, but very much ‘brain distraction’ such as logic puzzles or crosswords. The theory here is that the part of the brain (amygdala) that is causing the fear also is the part that deals with decision-making and such. If that area of the brain is already occupied with rationalizing and working out other puzzles, it can’t be afraid at the same time (this is my theory that I hope to develop further, or at least found a neuroscientist who has so I don’t have to). This is one of my most surprising and go-to mechanisms for coping with flight fear, and it seems to work quite well. I have simple crosswords (with hints) loaded on to my kindle and the small successes of correct answers also (likely) add a teeny bit of dopamine to the system (not unlike most pleasurable things/addictive drugs), which also help make one feel better. Unfortunately, this is one of those ‘before you fly’ type things, but making sure you have had enough sleep, water, and food is key. One of the things that may have made this particular flight so intense for my poor little brain was that I had had very little sleep, food, or water. All of these factors affect chemical balance in your brain and are important in overall function. And, as sad as it sounds, avoid caffeine. You know, to keep your heartrate down. Another “before you fly’ tool is to understand the science of flight, how flying works, and what all those noises on planes can mean. When purchasing tickets, perhaps choose an aisle seat for more access and ‘better escape route’. Or, if you’re fancy or lucky, snag the aisle seat AND the exit row. And, even better, those two things AND a seat near the front of the plane where turbulence is a bit less (think school buses. The back was always bumpiest). Keep track of the route and the stats on the in-flight screens. Before your flight, check out flightradar24.com to see all the magical planes up in the air, calm, peaceful, and not crashing. This is especially helpful for those who have friends/family who are afraid FOR you and who want to track your flight in intense detail. 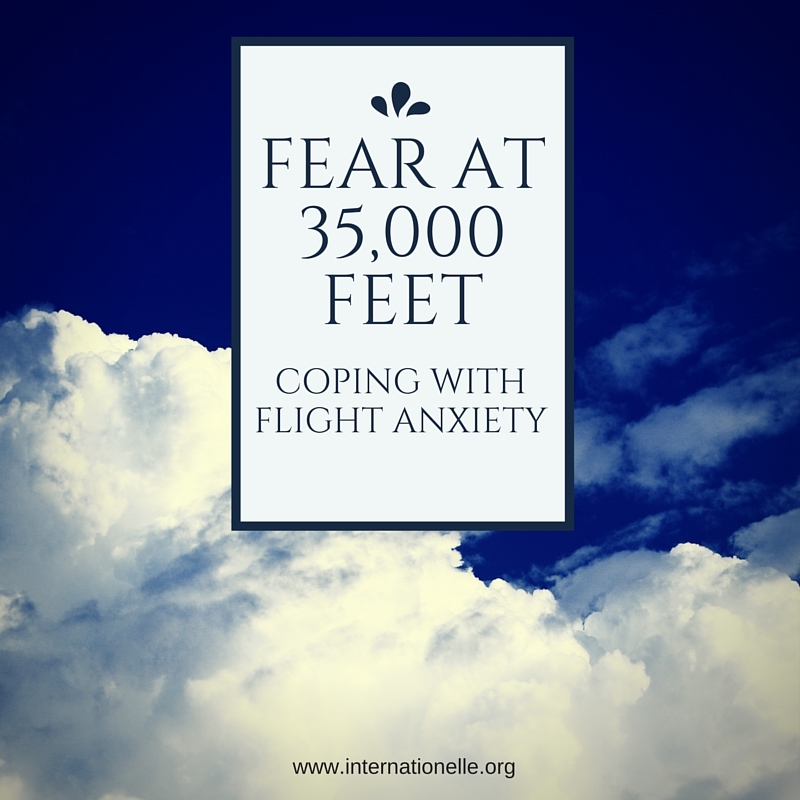 If you’re afraid of flying for a more claustrophobic reason, also a symptom of anxiety, some of these tips should also work, but also, relaxation of muscles. All muscles. Eye lids included. It’s almost instinctive to tense up when nervous or afraid, but really focusing on relaxing each and every muscle in turn might both serve to distract and, hopefully, to relax. Maybe even enough to put you to sleep in time for you to wake up, safe and sound, at your destination. This entry was posted in Uncategorized and tagged anxiety, coping, fight, flying, planes, travel, TravelHacking. Bookmark the permalink.